It’s time to list out the posts we’ve published on DailyBlogging during the month April. I hope you’ve already checked our Traffic Stats. We also announced the winners of the Top Commentators Award a couple of days ago, who won a 125*125 banner spot in the sidebar. Just three days have past in this month, so you can still participate in the Commentators award content and stand a chance to advertise your site here. Coming back to our topic of the Monthly Wrap-up, we were able to publish 15 posts during the entire month. Yes, it is definitely less than what we published in the month of March. But as I always say, Quantity or numbers don’t even stand in front of quality content. Hoping that you enjoyed reading the above posts. A big thank you to my Social Media friends who helped in sharing our blog posts from time to time. Over 200 Comments received in April. We received around 200 comments for our posts. So, that counts to more than 10 comments/posts. The credit to that, certainly goes to our lovely commentators who were involved in some quality discussions. If you’ve read the traffic stats post, you’ll know that my exams are going to be held by may end. So, it’s obvious that I’ll post relatively less than normal. So it would be a great help, if you could contribute to DailyBlogging by writing a guest post. If you are a new visitor, then consider Subscribing to Our RSS Feeds / Daily Updates. How many comments do your blog posts receive (on an average) ? Hey Mani, you’re doing a great job here on Daily Blogging. Congratulations on your success. The comments at your blog always fascinate me mani, i wondered if i can get some too 😉 10 comments/post damn awesome. Keep up man, your stats are good! 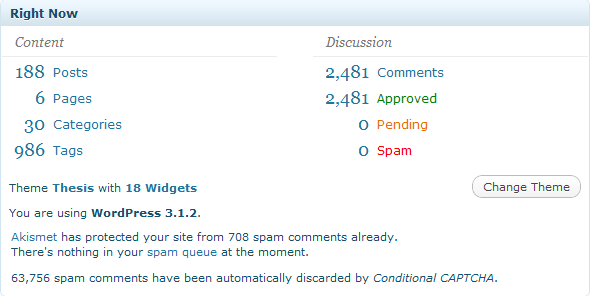 10 comments per post is indeed good, I either get 1 or 200 on a blog I own, it’s so crazy. For regular visitors to your excellent blog, your month end wrap up article is very useful. Keep up the good work, and bring us more interesting articles! I like this creative idea of posting an article in which you bundle up all your posts and share it!! A really good and creative idea!! Even it’s a better way to obtain more readership! !